We've heard from countless brand marketers about the need for guidance when it comes to measuring the value of social media advertising. It's why we've made a major investment towards helping advertisers understand how to achieve their brand goals in a social context. 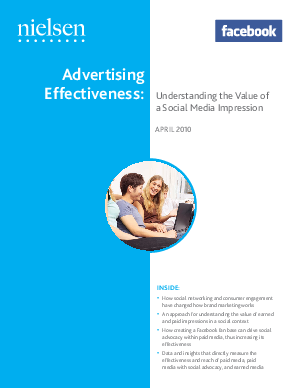 Our joint report provides early insights from Nielsen's BrandLift product which analyzed survey data from more than 800,000 Facebook users in response to more than 125 Facebook ad campaigns from 70 brand advertisers.